A 19th century golden Oak writing table made for Great Eastern Railways, stamped "GER and dated 1881". 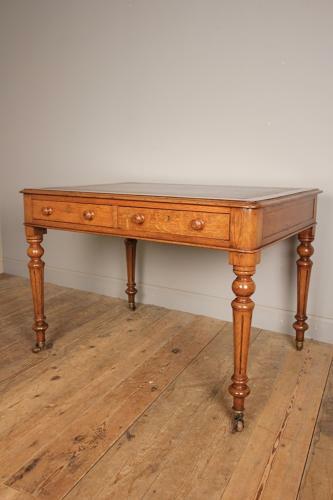 The table having 2 drawers with original knob handles, locks and escutcheon, raised on slender fluted legs and retaining the original and wonderful castors. The table with polish show-wood to all 4 sides. Having a brown leather top with tooled and gilt decoration. Lovely colour and lustre throughout. English, 1881.